E-Commerce has been around us for years and it has become a multi-billion dollar industry in the world. I personally believe, it is not telecommunication or other similar technological advancements but it is E-commerce which proves the world has become a global village. I mean how amazing is it, you can buy something from thousands of miles away and it arrived at your doorstep in few days. Contrary to popular belief, it is way easy to set an e-commerce business. However, like every other business, it needs marketing efforts and attention to details to be successful. In its simplest form, e-commerce refers to doing business online. Whether someone is selling a physical item like phone, laptop or something else, or they are selling digital goods like software, apps and songs, it is ecommerce. For example, in a broader sense, Google Play Store is an ecommerce website – they sell apps. There are three main types of ecommerce websites or business models. B2B, it refers to Business to Business where the seller and buyer both are businesses. Consider it a wholesale marketplace. AliExpress and AliBaba are two most popular examples. B2C, it refers to Business to Consumer where the seller is a business and the buyer is a consumer. Amazon and eBay are B2C ecommerce websites. The majority of ecommerce websites are B2C. C2C, it refers to Consumer to Consumer where the seller and buyer both are consumers; for example OLX and GumTree. These are not hard and fast rules as many sellers on OLX are businesses and many buyers on AliBaba are consumer. However, it is essential to learn these basics. 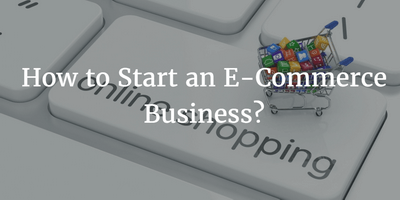 What Do You Need To Start an Ecommerce Business? Did you notice the above heading has two entirely different sections? “Business” and “Ecommerce”; we are here to talk about the ecommerce part from web development and digital marketing prospective. In order to start an ecommerce business, first you need a plan that’s the business part. Then you need a website and whether you do it on your own or get professional services, there are few things like you should know about website development. Always get a shorter domain name so your visitors can remember it easily. www.thisismyecommercewebsite.com is not a good name, www.Amazon.com is an easy to remember name. Shorter domain names are expensive but you would be able to find something reasonable with reasonable price tag. Now, your website is ready and semi-automatic; you have to upload products and relevant information manually while the processes related to shopping itself would be fully automatic like payment transactions, inventory update etc. The next step is digital marketing to increase your website exposure. Ecommerce website is exactly like a traditional shop or a store. Now you have created a new store that sells women apparel or something else. First, you need to get visitors in your shop. The more people coming into your store mean the higher chances of selling something. Yes, the obvious solution is advertisement and marketing. You need to do SEO (Search Engine Optimization), SEM (Search Engine Marketing) and SMM (Social Media Marketing) to advertise your store. There are two types of advertisement and marketing; organic and paid. Organic advertisement refers to natural advertisement without spending any money. For example, you can use social media to spread the word, you can make your website functional and beautiful to attract visitors and you can get in search engines’ good book so they favor you over other website because your website offers better contents than your competitors. Paid advertisement is a pretty simple concept. You pay for the advertisement just like you pay for the advertisement of a new shop or store (banners, billboards, ads etc.). Of course getting more people in your shop doesn’t mean everyone would buy something and here comes the concept of bounce rate and conversion rate. We would discuss these in upcoming post. By superadmin| 2017-02-21T15:21:56+00:00	January 16th, 2017|Categories: Beginner, Ecommerce, Marketing|Comments Off on How to Start an E-Commerce Business?